I’ve seen a lot of recent interest in Shinto, but there are very few resources on how non-Japanese people can participate in Shinto religious practices. This guide will be written from the perspective of Jinja Shinto and will hopefully help give you some ideas on where to start if you’re interested in practicing Shinto. As with my other guides, this guide is not meant to be definitive: it’s meant to help you along the way. As always, if you ever have any questions, feel free to ask! One of the first things you need to do if you are interested in Shinto is research. Unlike a lot of other religious movements, Shinto still exists within Japan. We, as foreigners, need to make sure that we have a decent knowledge base in what Shinto is and how to practice it respectfully. Jinja Shinto is an open practice and can be practiced by non-Japanese people, however there are certain things that are considered taboo within Shinto. Learning the basics of the religious practice will serve you well, both in interacting with other Shintoists, but also in interacting with Kami. So while I may place a lesser emphasis on research with other religious practices, I must state that in this case you really should make an effort to learn the basics before you begin working on setting up your religious practice. One of the best places to start with research is the Tsubaki Grand Shrine of America. They have a website and a Facebook page with lots of information. Additionally, Rev. Barrish-sensei, the person who runs Tsubaki GSA, is always open for questions regarding Shinto. When in doubt, ask him first. I also think it is imperative that anyone who is interested in Jinja Shinto read Kami no Michi. This book is available for free online and was written by Yukitaka Yamamoto, the head Guji of Ise Jinja, the parent shrine of Tsubaki GSA. It is due to Yukitaka’s work that we as non-Japanese can even consider practicing Shinto today. In this book, he lays out the basic beliefs and protocol for practicing Shinto as well as discussing the future he saw for Shinto. This book will help to create a general knowledge base for what Shinto is and what it means to be a Shintoist. For other reading recommendations, take a look at the Shinto resources page. I’ve read about Shinto, and it sounds like a good fit for me. What do I do now? One of the central parts of Jinja Shinto is the focus on the Jinja- the shrine itself. Usually in Japan, people will go to the local shrine for major life events, festivals, and other religious ceremonies. Most of us don’t have this option- as there are no shrines that are close enough for regular visits. Many Pagan and polytheistic traditions in our community/society emphasis a self-selected devotee-deity relationship, Shinto is a bit different in its approach. Traditionally, your Kami would be tied to your family, the local shrine, and/or your profession. So when you decide that you want to move forward with Shinto, it can be difficult to figure out how to “choose” a Kami to work with. When you’re first starting, I highly recommend that you focus on the predominant/closest Jinja to you as a starting point. Since most of us don’t live in Japan, that would be Tsubaki GSA. But since many of us don’t live in Washington and can’t go to the shrine directly, we have to learn to bring the shrine to us. This can be done in a couple of ways. 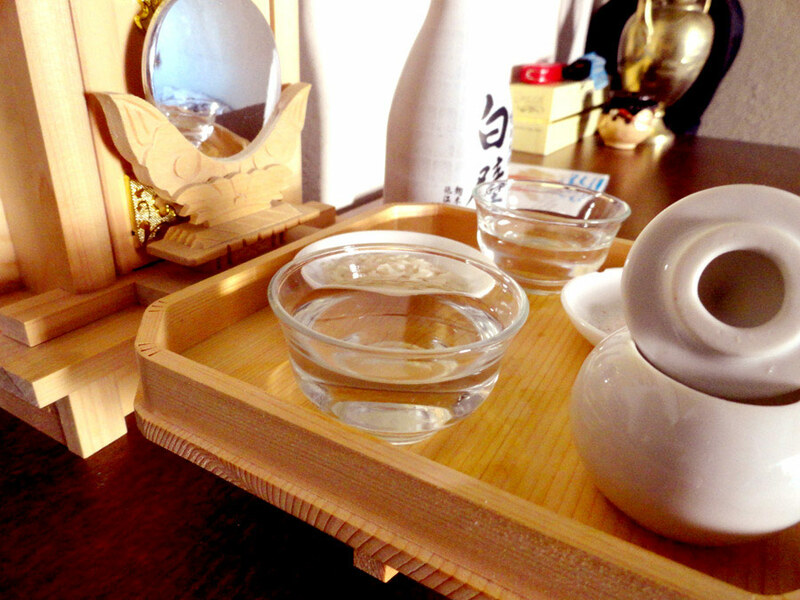 The most basic format is to acquire a kamidana, ofuda, shinki set (offering dishes), and ozen (tray) and perform daily rites in your home to the Kami. If you wanted to take it a step further, you could join the Sukeikai group that is tied to Tsubaki GSA which will allow you to participate in festivals remotely. All of the items for your practice can be purchased online. While its possible to get the kamidana, ozen and shinki set from different websites, you will need to purchase your ofuda from the Shrine directly. I usually recommend getting the kamidana from the Shrine directly as well because Barrish-sensei can do all of the necessary purifications to the kamidana before sending it to you. Additionally, the staff at Tsubaki GSA survives entirely off of the generosity of the Jinja’s members and patrons; your donations do have a direct effect on the livelihood of the shrine itself. When you reach out to receive an ofuda from the Jinja, you’ll be able to pick from the Kami who are enshrined at Tsubaki GSA. If you become a member of the Sukeikai, you will also receive a membership handbook that includes basic worship guidelines (such as daily ritual instructions) and quarterly newsletters from the Shrine directly. You will also receive various items throughout the year to participate in the various Taisai/festivals that occur. This can be a great benefit to those who are unable to attend these events in person. While the full proper Shinto setup is nice, it is not something that everyone can achieve for a variety of reasons. Sometimes money is tight, sometimes we live with family that doesn’t want us to openly practice anything besides their main religion. Some of us don’t have spoons to maintain an ofuda- and all of these things are okay. There is more than one way to practice Shinto, and even if you have a kamidana with a live ofuda in it (or plan on getting these things), you should still read through this section and start with the basics first. There are two angles to approach Shinto with no supplies: the first is the focus on the Kami that are always around us, regardless of whether you have an ofuda or not; the second is living with Shinto ideals in mind and putting those ideals into practice daily. Let’s cover reaching out to Kami without an ofuda first. One of the biggest Kami that you can reach out to daily is Amaterasu- who you can see in the sun. If you want a relatively simple rite you can perform daily to Amaterasu, go outside each morning and pray to the sun. It’s recommended for Shintoists who are traveling to pray to the sun when they don’t have their kamidana with them. Other possibilities would be to use something local that is long and thin in shape for a Kami to alight upon (such as a stone, branch or banner). Before there were ofuda, there were Yorishiro, which are temporary vessels for the Kami to reside in. While it may not be standardized practice anymore, it could be an alternative to consider if obtaining an ofuda is currently out of your possibilities. Alternatively, you can explore working with local land spirits– which are also a form of Kami, even if they aren’t in the official records. If you’re unsure about whether you want to go all out with keeping an ofuda in your house, I recommend starting with these two things first. That way, you can ascertain if daily rites and having entities in your house is something you’re really prepared to deal with. Secondly, there is the aspect of living the Shinto religion. According to Barrish-sensei, being Shinto consists of three things: living in harmony with Great Nature, showing gratitude for what you have, and being sincere in your actions. None of these things require an ofuda or a kamidana, but they do require a certain mindset and lifestyle. You may perform rituals daily, but if you are not trying to embody these aspects of Shinto, then you are likely missing the point. I highly recommend cultivating these traits within your life and yourself first in order to see how Shinto belief works for you. If you decide that you are ready for a more formal Shinto practice, this is the section to read. For a standard Jinja-styled daily practice, you will need a kamidana or an ofuda stand with an active ofuda in place. 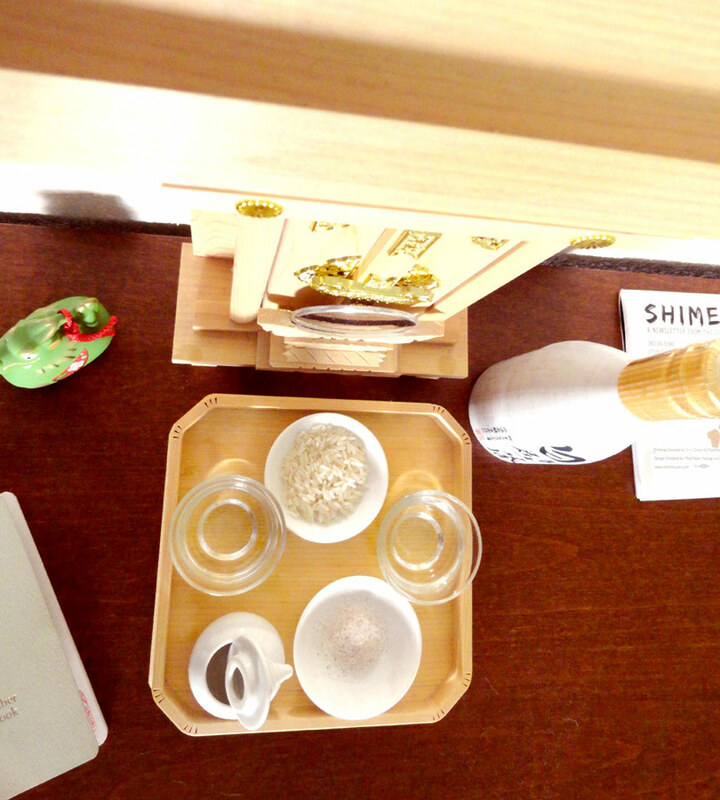 You will also need a shinki set (offering dishes) and possibly an ozen (tray) to carry the shinki set on. Kamidana are essentially houses for the ofuda. They are made of hinoki wood and are made to a certain ritual purity standard. Kamidana are ideally in a clean area that is up high. Kami tend to prefer to alight in high spaces, and they have a preference for cleanliness (a main focal point of Shinto), so keep these in mind when you place your kamidana in your home. You will want the kamidana to be in a quiet area. For a square tray, use the setup on the left. For a long tray or no tray, use the order on the right. You will carry the ozen to the kamidana with both hands and approach your kamidana off of center line. Center line is a very important place in front of your kamidana, and you should always attempt to approach the kamidana from a slightly off-center direction when not interacting with the Kami directly. Set the ozen down on the kamidana shelf and slide it towards the kamidana. Your shinki set does have lids on certain containers, and you will remove them in a specific order as well (left sake, right sake, water lid is placed on the edge). After you have set the offerings in their proper areas, step back slightly and clap twice. You will then approach the kamidana from the center line and state your prayers and any norito you have. It is generally regarded that you should not only pray for yourself, but for the peace and safety of the world as well. Within Shinto there is a large focus on the community- and that should be remembered. When you are done, you will want to clap twice, bow twice, and then clap once. You will normally take a step backwards, bow slightly, and then take your leave. In the evening you will approach the kamidana again at the center line. You will bow and thank the Kami for watching over you. If you are feeling grateful for anything in particular, or wish to share anything with them about the day you just experienced, this would be an ideal time for it. Once you are done speaking, you will clap twice, bow twice, clap once. You then step off of center line and replace the caps in the reverse order on your shinki set. Remove the offerings from the kamidana shelf and you’re done. Within Shinto, its regarded as proper to try and use the offerings in your meals. However, if that’s not possible, place them outside for the local animals to eat. If that is not an option, contact Barrish-sensei for suggestions on how to proceed. Taisai and Festivals: How do I celebrate when I live so far away? And finally we come to the calendar aspects of Shinto. Shinto has quite a few major festivals throughout the year, and throughout one’s lifetime. You can see a current calendar/schedule for Tsubaki GSA here. Generally speaking a lot of these festivals are there to mark changes in the seasons, changes in our lives, and to purify ourselves. Clean myself and my house and everything I see. Clean the kamidana and the shelf it resides on. Prepare nicer offerings for the Kami. Present the offerings along with norito. Prayers and words of gratitude and thanks to the Kami. Leave the offerings up for the length of the rest of the day (usually) and remove in the evening. Certain holidays have certain foods associated with them or certain activities associated with them- which I will sometimes do while at home, too. For specifics on each of the Taisai, I recommend checking out the Tsubaki FB page, or my Shinto tag. If you are in doubt about ways to celebrate at home, contact Barrish-sensei for some suggestions. Like this guide? Want to see something else added to it? Have suggestions, feedback, ideas? Please contact me and share your thoughts! 1. You outline a different sequence of claps and bows for use with the kamidana than the standard sequence for praying at a shrine (bow-bow-clap-clap-pray-bow). Why is it different? 2. Can a kamidana and ofuda be used to pray if one does not have the resources to make the daily offerings? 3. In the “Practicing with Minimal (or no) Supplies” you mention possibly not having spoons to maintain an ofuda. What’s that referring to? 4. Is there a specific form to follow in things such as praying to Amaterasu in the sun in lieu of having a kamidana and ofuda? i.e. do you use the bow-bow-clap-clap-pray-bow pattern like in shrines, or is it appropriate to use something more abbreviated? 1. I’m using the sequence that Barrish-sensei gives all of the Sukeikai members. He is a larger authority on the sequences that should be used, so I use what he has given members. 2. I think this would be better answered by Barrish-sensei. I personally would lean towards no, because the ofuda is a place where Kami alight from. It’s like having a piece of Kami inside of your house. I worry that not giving offerings may lead it to being “hungry”, if you will. Or that it may register as a form of neglect towards the Kami. However, I am not as well versed in the nuances of this as Barrish-sensei would be. I will say, though, that the main reason I am no longer a part of the Sukeikai is because I lacked the ability to give offerings daily, and did not wish to offend Kami-sama. So you can take that however you will. Pingback: Solarpunk Thoughts, Sources and Definitions – Solarpunk! As I understand it, you could offer some other beverage that is considered somewhat healthy (aka, no soda) to the Kami, or more water. I’d check with Barrish-sensei over on Facebook to see if he’s got any other recommendations or information that I don’t. I’ve heard you shouldn’t offer incense to the Kami is this true? I know that it’s not a traditional offering, so I typically didn’t offer it directly. I may burn it in the background as a pleasing scent that the Kami may like, but have never offered it directly to them. As my sinuses have gotten more sensitive, I’ve had to cut out incense from all of my practices all together… they never seemed to mind either way, but you may have different experiences. I might check with Barrish-sensei to see what he has to say on the matter. Thank you for taking the time to write this; it was very informative and helpful. However, I’d like to point out that the new address of the Sukeikai page is http://www.tsubakishrine.org/membership/index.html The old link leads to a 404 page. So for anyone interested in joining Sukeikai, whether now or later, please use this link instead!